We generally use UK or EU sizes. Mondo sizes are used in plastic ski boots. Some of our rock shoes come in half EU sizes. Conversions are approximate only and will vary from brand to brand. Where a brand has unusual sizing there you may find a specific sizing chart on the individual product page. Always use this in preference to these charts. 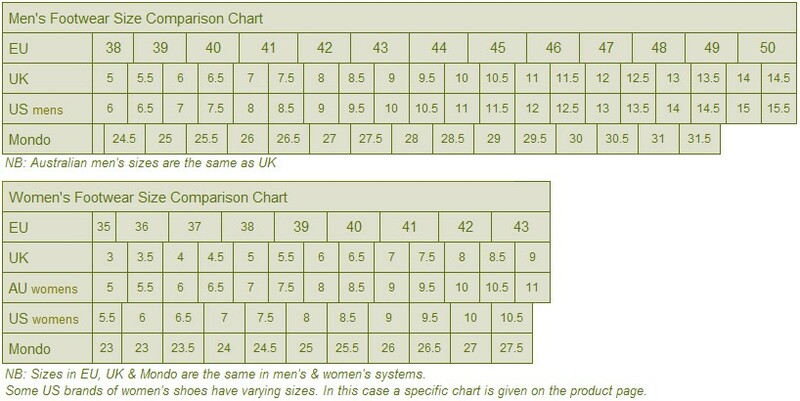 NB: Sizes in EU, UK & Mondo are the same in men's & women's systems. Australian men's sizing and UK sizing are the same. Some US brands of women's shoes have varying sizes. In this case a specific chart is given on the product page.